Dec. 12, 2007: This webpage has been superceded by the 2008 version. Garrison Keillor, "On the Road Avec M. Lévy," New York Times, Jan 29, 2006. Note the link to the whole first chapter of the original book. Klemperer mentions the "Horst-Wessel-Song" many times (see index entry on p. 508, and the note in the middle of p. 459). You can read the text and listen to a recording on Chuck Anesi's Horst Wessel Page , and in the Internet Modern History Sourcebook. For the official anthem Deutschland über Alles see Frank Petersohn's German Folk Song's page. The first of the 3 MP3s is best. H-German review of LTI, Klemperer's first postwar book, 7/03 of 2002 English edition & annotated edition. Also discussion with Prof. Mahlendorf about her memoir, chapters 4 and 5. This year's theme was Testimony and Memory. 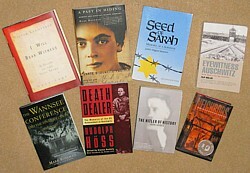 We started by taking two weeks to read Victor Klemperer's diaries for 1933-1941; then again Mark Roseman's Past in Hiding; back to another perennial favorite with Isaacson's Seed of Sarah; also repeating Müller's Sonderkommando memoir; then Roseman's book on the Wannsee conference (as an analysis of various sources); Auschwitz commandant Höss's memoir; Lukacs' study of books about Hitler, and finally Jan Gross's Neighbors, a study of a massacre in an eastern Polish town. Klemperer, Wannsee and Lukacs on Hitler I've never used before; I tried Gross in a 4-unit GE freshman seminar in 2003, and it didn't work (too challenging). March 21, 2005: I may be offering this course again in Winter 2006. Expect at least half of the books to change. See the 2004 syllabus. [added 1/06: 2006 syllabus]. 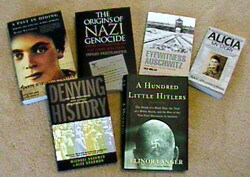 Contact me by e-mail to discuss whether your preparation is sufficient: marcuse@history.ucsb.edu. 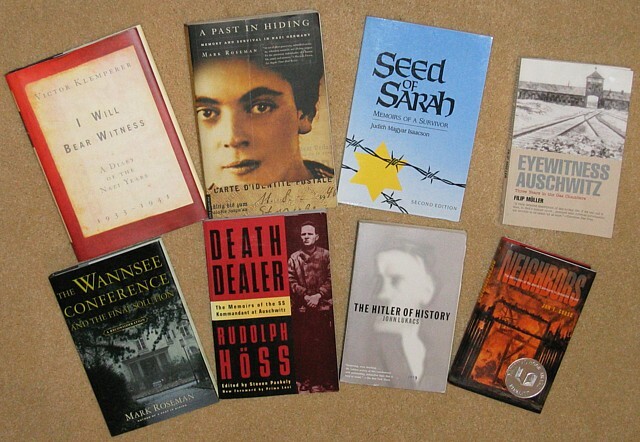 Although I haven't finalized this year's syllabus yet, the eight books we will be reading for this course have been set for some time. If you are sure that you are up to the book-a-week pace (we will also practice how to read at that rate) and will stick with this course, you may want to try to save some money by purchasing the books used or on-line. (I now purchase most of my books this way, unless I'm in a rush.) It may be short notice for the first book, but there should be ample time for the rest. See the links in the Nov. 18 announcement, immediately after this one. Reading through the "course history" section below will give you a good idea of how the course works. For 2006 I think I will go back to the way I did it in 1998, beginning each class with a professor-led discussion, then turning it over to student teams who did background research. Jan. 19, 2006: I finally finished updating this site for 2006. The 2006 syllabus is now available. See below especially the links to reviews of Klemperer, as well as some links for the "Horst-Wessel-Song," which Klemperer mentions many times (see the note in the middle of p. 459). Jan. 19, 2006: I had promised to send out a list of topics and who signed up for them: it appears below and I will send it on e-mail. Now that you have had a chance to look at the books yourselves, we can discuss in class on 1/25 whether anyone wants to join another group or trade. If anyone is willing to double up, I'd encourage you to look at Wannsee, Höss and Lukacs again. I think it can be much easier to discuss a book with one of your peers in advance of class. Jan. 26, 2006: Students have asked about "what makes good questions." If you have received a "+" for your questions on Klemperer and are willing to let me post them on this website, let me know (and send them, if I don't have an electronic copy already). For now, see the "Weekly Topics" below, where you'll find sample essays (Janet's from this year, otherwise from 2004), and sample questions (2004 about Müller's Auschwitz memoir). Feb. 2, 2006: More sample discussion questions added to topics section, below; also some links on Seed of Sarah.